The camera was invented in 1839, and by the next decade, photographers had already begun to manipulate photographic images. Initially, the manipulation was part of the exploration of the artistic potential of the new medium. Soon, the informational power of the photograph became recognized. The techniques of photo alteration have been exploited to generate images that are different from the actual scene that is photographed for purposes of intelligence gathering or deception. For example, by the 1940s, the Soviet Union was actively manipulating photos in a campaign of misinformation to portray their leaders favorably. In the intelligence and security communities, photo alteration serves two important purposes. The first purpose is to gather information, most often through magnification of photos. The use of spy satellites reveals facilities and operations that can be crucial to national security. One example is the famous photos of a Soviet rocket installation in Cuba during the presidency of John F. Kennedy. In the modern era, satellite photos purporting to show biological weapons production facilities have increased the resolve of the United States to topple the government of Iraq. The ability to produce photographs that reveal more detail than do traditional photographs, especially at longer distances or using small cameras, has increased the information that can be gathered. The second purpose of photo alteration is to misinform or deceive. With new technology, the ability to alter a photographic image is easier than ever before. For example, in a traditional photograph, the difference in skin tone between a face and the neck or shadows that point in different directions can be clues that an image has been manipulated. However, these visual discrepancies can be eliminated in the digital image. Thus, the ability to generate false or misleading information has become routine. Traditional photo alteration. In the days before digital technology, photo alteration was accomplished in the darkroom during the development and printing of the photograph. In a technique called dodging, the light shining through the photographic negative onto light-sensitive paper was obscured. Because less light strikes the paper, that region appears lighter in the developed image. In contrast, the technique of burning allows an increased amount of light to strike the photographic paper. The result of burning is to make the region appear darker in the print. The traditional techniques of dodging and burning are used to enhance or disguise aspects of the photo. As well, details can be excluded from an image by the use of cropping, where only the selected portion of the image is printed. Photographs can also be enlarged to selectively print portions of the image. Enlarging cannot be done indefinitely, however, since the eventual inability to separate the informational components of the image from one another produces a blurry picture. 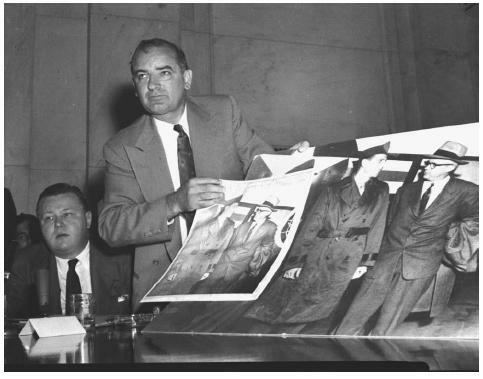 Senator Joseph McCarthy answering charges that the photo, foreground, submitted as an exhibit at Army dispute hearings in 1954, had been altered. reality, Leon Trotsky was also on the film. In a massive campaign of historical revisionism during the leadership of Joseph Stalin, Trotsky's involvement in this and other photographed events was erased in an attempt to purge the memory of opposition to Stalin's leadership. Another ploy of photo manipulation is the false captioning of an image. By excluding, exaggerating, or falsifying details of an image, the viewer can misinterpret what is seen. For example, during World War II the United States plowed fields on some South Pacific Islands, then took aerial photos of them. The photos were labeled as representing air bases, creating a deception that the military resources in the area were much more extensive than was actually the case. Digital photo alteration. The coming of digital photography revolutionized the ability to alter photographs. The laborious darkroom manipulations of preceding times could be accomplished by a few commands in specialized photographic software. In traditional photography, the reflected light from the subject enters the camera through the lens and is focused onto the surface of a light-sensitive emulsion. The emulsion records the image, which can be beamed onto light-sensitive photographic paper. The paper is subsequently treated with chemicals to make the image appear. It is during this latter printing process that the alteration of the photograph can be accomplished. In digital photography, the reflected light that enters the camera is focused onto a chip that is known as a charged coupling device (CCD). The surface of the CCD contains an array of light-sensitive photo diodes. Each diode represents a pixel (the basic unit of programmable color in a computer image). Each photo diode is hooked up to a transistor, which sends an electrical signal (whose voltage corresponds to the light intensity that registered on the photo diode) to another chip. The second chip converts the electrical signal to digital information—1s and 0s—that can be interpreted by computerized photo manipulation software programs. Colors are assigned a code sequence between 0 and 255; 0 is black and 255 reveals the most intense shade of red possible by the software. These coded assignments are in turn converted to sequences of 0s and 1s. Black, for example, is 00000000, while the most intense red is 11111111. Shades in between are combinations of 0s and 1s in the eight-digit sequences. Digital photo manipulation involves the alteration or elimination of the digital 1s and 0s. Changing an eight-digit sequence is trivial. When the digital information is reconstructed into an electronic image, the result can be an altered color. In addition to color change, a myriad of effects are possible, including color enhancement, elimination of regions of the image, increased contrast, correction of a blurred image, and the merging of other images with the original image (a photographic version of the "cut and paste" operations in word processing). As digital photo manipulation software has increased in technical sophistication, and people have become more adept at using the software, the task of detecting manipulated images has become very challenging. Digital photographic manipulation is now so sophisticated that it can sometimes be impossible to discern whether people or objects in a photograph were actually there when the photo was taken. This has spurred efforts, especially in the military and intelligence communities, to establish a system of image verification. In this regard, the United States Air Force Research Laboratory in Rome, New York, has developed a technique called digital watermarking. Akin to the watermarking of paper currency to establish authenticity, digital watermarking embeds an encrypted image over the actual photo image. The encrypted image is invisible to the naked eye, but can be detected by specially designed image scanners. The lack of the digital watermark is evidence of an altered image. Digital cameras can also be mounted in satellites in orbit hundreds of miles above the Earth. These cameras can provide images that can be manipulated to allow objects that are as close to one another as a meter or two to be visually distinguished from each other. This resolution is a vast improvement from that possible using traditional light-sensitive photographic film. This form of digital photo manipulation has improved the capability of intelligence agencies to spy on other countries or organizations from a long distance. In the U.S., government scrutiny and interpretation of photographs is the function of the National Imagery and Mapping Agency's National Photographic Interpretation Center (once part of the Central Intelligence Agency's Directorate of Science and Technology). Beale, Stephen. Web Tricks and Techniques: Photo Manipulation: Fast Solutions for Hands-On Web Design. Gloucester, MA: Rockport Publishers, 2002. Brugioni, Dino A. Photo Fakery: The History and Techniques of Photographic Deception. Washington, D.C.: Brassey's, 1999.